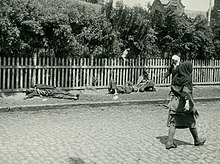 For the same famine particularly in Ukraine and Kazakhstan, see Holodomor and Kazakh famine of 1932–33. Famine in the USSR, 1933. Areas of most disastrous famine marked with black. A – grain-consuming regions, B – grain-producing regions. C – former land of Don, Kuban and Terek cossacks, C1 – former land of Ural and Orenburg cossacks. 1. Kola Peninsula, 2. Northern region, 3. Karelia, 4. Komi, 5. Leningrad Oblast, 6. Ivanovo Oblast, 7. Moscow Oblast, 8. Nizhny Novgorod region, 9. Western Oblast, 10. Byelorussia, 11. Central Black Earth Region, 12. Ukraine, 13. Central Volga region, 14. Tatar, 15. Bashkortostan, 16. Ural region, 17. Lower Volga region, 18. North Caucasus Krai, 19. Georgia, 20. Azerbaijan, 21. Armenia. The Soviet famine of 1932–33 was a major famine that killed millions of people in the major grain-producing areas of the Soviet Union, including Ukraine, Northern Caucasus, Volga Region and Kazakhstan, the South Urals, and West Siberia. The Holodomor in Ukraine and Kazakh famine of 1932–33 have been seen as genocide committed by Joseph Stalin's government; it is estimated between 3.3 and 7.5 million died in Ukraine and ~2,000,000 (40% of all Kazakhs) died in Kazakhstan. Between 2.4 and 4 million ethnic Ukrainians are estimated to have perished as a result of the famine. The exact number of deaths is hard to determine due to a lack of records, but the number increases significantly when the deaths in the heavily Ukrainian-populated Kuban region are included. Older estimates are still often cited in political commentary, According to the findings of the Court of Appeal of Kiev in 2010, the demographic losses due to the famine amounted to 10 million, with 3.9 million direct famine deaths, and a further 6.1 million birth deficit. Stalin and other party members had ordered that kulaks were "to be liquidated as a class"  and so they became a target for the state. The richer, land-owning peasants were labeled 'kulaks" and were portrayed by the Bolsheviks as class enemies, which culminated in a Soviet campaign of political repressions, including arrests, deportations, and executions of large numbers of the better-off peasants and their families in 1929–1932. Major contributing factors to the famine include: The forced collectivization of agriculture as a part of the Soviet first five-year plan, forced grain procurement, combined with rapid industrialisation, a decreasing agricultural workforce, and several bad droughts. The famine is seen by some historians as a deliberate act of genocide against ethnic Ukrainians and Kazakhs while other critics dispute the relevance of any ethnic motivation, as is frequently implied by that term, and focus instead on the class dynamics between land-owning peasants (Kulaks) with strong political interest in private property, and the ruling Communist Party's fundamental tenets which were diametrically opposed to those interests. :507 In addition to the Kazakh famine of 1919–1922, These events saw Kazakhstan lose more than half of its population within 15 years due to the actions of the Soviet power. The famine made Kazakhs a minority in their own republic. Before the famine, around 60% of the republic's population were Kazakhs, but after the famine, only around 38% of the population were Kazakhs. Unlike the previous famine of 1921–22, Russia's intermittent drought was not severe in the affected areas at this time. Historian Mark B. Tauger of West Virginia University suggests that the famine was caused by a combination of factors, specifically low harvest due to natural disasters combined with increased demand for food caused by the industrialization and urbanization, and grain exports by the Soviet Union at the same time. The industrialization became a starting mechanism of the famine. Stalin's First Five-Year Plan, adopted by the party in 1928, called for rapid industrialization of the economy, with an emphasis on heavy industry. With the greatest share of investment put into heavy industry, widespread shortages of consumer goods occurred while the urban labor force was also increasing. Collectivization employed at the same time was expected to improve agricultural productivity and produce grain reserves sufficiently large to feed the growing urban labor force. The anticipated surplus was to pay for industrialization. Kulaks who were the wealthier peasants encountered particular hostility from the Stalin regime. About one million kulak households (some five million people) were deported and never heard from again. Forced collectivization of the remaining peasants was often fiercely resisted resulting in a disastrous disruption of agricultural productivity. Forced collectivization helped achieve Stalin's goal of rapid industrialization but it also contributed to a catastrophic famine in 1932–33. A similar view was presented by Stephen Wheatcroft, who has given more weight to the "ill-conceived policies" of Soviet government and highlighted that while the policy was not targeted at Ukraine specifically, it was Ukraine who suffered most for "demographic reasons". Lewis H. Siegelbaum, Professor of History at Michigan State University, states that Ukraine was hit particularly hard by grain quotas which were set at levels which most farms could not produce. The 1933 harvest was poor, coupled with the extremely high quota level, which led to starvation conditions. The shortages were blamed on kulak sabotage, and authorities distributed what supplies were available only in the urban areas. The loss of life in the Ukrainian countryside is estimated at approximately 5 million people. The "Decree About the Protection of Socialist Property" – nicknamed by the farmers the Law of Spikelets – was enacted on August 7, 1932. The purpose of the law was to protect the property of the collective farms. It was nicknamed the Law of Spikelets because it allowed people to be prosecuted for gleaning leftover grain from the fields. There were more than 200,000 people sentenced under this law. There was a wave of migration due to starvation, and authorities responded by introducing a requirement that passports be used to go between republics, and banning travel by rail. Soviet internal passports (identity cards) were introduced on 27 December 1932 to deal with the exodus of peasants from the countryside. Individuals not having such a document could not leave their homes on pain of administrative penalties, such as internment in Gulag labor camps. The rural population had no right to freely keep passports and thus could not leave their villages without approval. The power to issue passports rested with the head of the kolkhoz, and identity documents were kept by the administration of the collective farms. This measure stayed in place until 1974. The lack of passports could not completely stop peasants' leaving the countryside, but only a small percentage of those who illegally infiltrated into cities could improve their lot. Unable to find work or possibly buy or beg a little bread, farmers died in the streets of Kharkiv, Kiev, Dnipropetrovsk, Poltava, Vinnytsia, and other major cities of Ukraine. The Russian part of the inscription says "At this place will be a monument to famine victims of the years 1931-1933". In the center of Almaty, Kazakhstan. The upper half is in Kazakh language. Ukrainian President Viktor Yanukovych and Russian President Dmitry Medvedev on 17 May 2010 near Memorial to the Holodomor Victims in Kiev. The famine of 1932–1933 was officially denied, so any discourse on this issue was classified as criminal "anti-Soviet propaganda" until Perestroika. The results of the 1937 census were kept secret as they revealed the demographic losses attributable to the Great Famine. Some well-known journalists, most notably Walter Duranty of The New York Times, downplayed the famine and its death toll. In 1932, he received the Pulitzer Prize for Correspondence for his coverage of the Soviet Union's first five-year plan and thus, he was considered the most expert Western journalist to cover the famine. 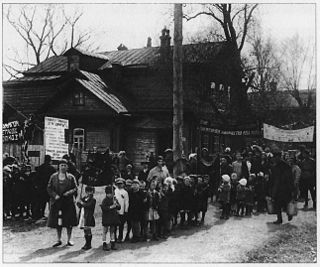 In an article "Russians Hungry, But Not Starving", he responded to an account of starvation in Ukraine and, while acknowledging that there was widespread malnutrition in certain areas of the USSR (including parts of the North Caucasus and Lower Volga), generally disagreed with the scale of the starvation and claimed that there was no famine. Duranty's coverage led directly to Franklin Roosevelt officially recognizing the Soviet Union in 1933 and thus revoked the United States' official recognition of an independent Ukraine. A similar position was taken by the French Prime Minister Edouard Herriot, who toured the territory of Ukraine during his stay in the Soviet Union. Other Western journalists, however, did report on the famine at the time, including Malcolm Muggeridge and Gareth Jones, who both severely criticised Duranty's account and were later banned from returning to the Soviet Union. As a child, Mikhail Gorbachev experienced the Soviet famine in Stavropol, Russia. He recalled in a memoir that "In that terrible year [in 1933] nearly half the population of my native village, Privolnoye, starved to death, including two sisters and one brother of my father." George Orwell's Animal Farm was inspired by Gareth Jones articles about the Great Famine of 1932–1933. The International community has denounced the USSR government for the events of the years 1932-1933. Holodomor that took over Ukraine is often classified as genocide. However, the classification of Holodomor as Genocide is a subject of debate. A comprehensive criticism is presented by Michael Ellman in the article "Stalin and the Soviet famine of 1932 - 33 Revisited" published in the journal in Europe-Asia Studies. The author refers to the UN Convention which specifies that genocide is the destruction 'in whole or in part' of a national group, "any acts committed with intent to destroy, in whole or in part, a national, ethnical, racial or religious group". The reasons for the Holodomor are claimed to have been rooted in the industrialization and widespread collectivization of farms that involved escalating taxes, grain-delivery quotas, and dispossession of all property. The latter was met with the resistance that was answered by “imposition of ever higher delivery quotas and confiscation of foodstuffs.” As people were left with insufficient amount of food after the procurement, the famine occurred. Therefore, Holodomor occurred, in most part, due to the policies that favored the goals of collectivization and industrialization rather than the deliberate attempt to destroy Ukrainians as a nation. As "The excess deaths of 1932 – 33 were only a relatively small proportion (very roughly a tenth) of the total Ukrainian population," the event fails to satisfy the definition within the definition given by the UN. The 2004 book The Years of Hunger: Soviet Agriculture, 1931–33 by R.W. Davies and S.G. Wheatcroft, gives an estimate of 5.5 to 6.5 million deaths. Encyclopædia Britannica estimates that 6 to 8 million people died from hunger in the Soviet Union during this period, of whom 4 to 5 million were Ukrainians. Robert Conquest estimated at least 7 million peasants' deaths from hunger in the European part of the Soviet Union in 1932–33 (5 million in Ukraine, 1 million in the North Caucasus, and 1 million elsewhere), and an additional 1 million deaths from hunger as a result of collectivization in Kazakh ASSR. Another study, by Michael Ellman using data given by Davies and Wheatcroft, estimates "‘about eight and a half million’ victims of famine and repression", combined, in the period 1930–33. 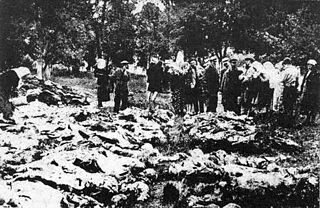 In his 2010 book Stalin's Genocides, Norman Naimark estimates that 3 to 5 million Ukrainians died in the famine. In 2008 Russian state Duma issued a statement about the famine, stating that within territories of Povolzhe, Central Black Earth Region, Northern Caucasus, Ural, Crimea, Western Siberia, Kazakhstan, Ukraine and Belarus the estimated death toll is about 7 million people. ^ In November 2009, Gareth Jones' diaries recording the manmade genocide of the Great Soviet Famine of 1932-33 went on public display for the first time at Cambridge University. ^ Engerman, David (June 2009). Modernization from the Other Shore (Google Books). ISBN 9780674036529. ^ "Famine on the South Siberia". Human Science. RU. 2 (98): 15. ^ "Demographic aftermath of the famine in Kazakhstan". Weekly. RU. Jan 1, 2003. ^ Volkava, Elena (2012-03-26). "The Kazakh Famine of 1930–33 and the Politics of History in the Post-Soviet Space". Wilson Center. Retrieved 2015-07-09. ^ "Famine of 1932 | Soviet history". Encyclopedia Britannica. Retrieved 2019-02-04. ^ Snyder 2010, p. 53. "One demographic retrojection suggests a figure of 2.5 million famine deaths for Soviet Ukraine. This is too close to the recorded figure of excess deaths, which is about 2.4 million. The latter figure must be substantially low, since many deaths were not recorded. Another demographic calculation, carried out on behalf of the authorities of independent Ukraine, provides the figure of 3.9 million dead. The truth is probably in between these numbers, where most of the estimates of respectable scholars can be found. It seems reasonable to propose a figure of approximately 3.3 million deaths by starvation and hunger-related disease in Soviet Ukraine in 1932–1933". ^ a b Наливайченко назвал количество жертв голодомора в Украине [Nalyvaichenko called the number of victims of Holodomor in Ukraine] (in Russian). LB.ua. 14 January 2010. Retrieved 21 July 2012. ^ "Yulia Tymoshenko: our duty is to protect the memory of the Holodomor victims". Tymoshenko's official website. 27 November 2010. Archived from the original on 2010-11-29. Retrieved 21 July 2012. ^ Naimark 2010, p. 70. ^ "Harper accused of exaggerating Ukrainian genocide death toll". MontrealGazette.com. 30 October 2010. Retrieved 21 July 2012. ^ Conquest, Robert (1986). The Harvest Sorrow. New York: Oxford University Press. p. 117. ISBN 978-0195051803. ^ a b Naimark, Norman M (2010), Stalin's Genocides (Human Rights and Crimes against Humanity), Princeton University Press, p. 131, ISBN 978-0-691-14784-0 . ^ http://world.lib.ru/p/professor_l_k/070102_koval_drujba.shtml - "Запомнил и долю казахов в пределах своей республики - 28%. А за тридцать лет до того они составляли у себя дома уверенное большинство"
^ PIANCIOLA, NICCOLÒ (1 January 2001). "The Collectivization Famine in Kazakhstan, 1931–1933". Harvard Ukrainian Studies. 25 (3/4): 237–251. JSTOR 41036834. PMID 20034146. ^ a b "Welsh journalist who exposed a Soviet tragedy". walesonline.com. November 13, 2009. Retrieved April 7, 2016. ^ Brown, Mark (November 12, 2009). "1930s journalist Gareth Jones to have story retold: Correspondent who exposed Soviet Ukraine's manmade famine to be focus of new documentary". The Guardian. London. Retrieved April 7, 2016. ^ Viktor Kondrashin [ru], Голод 1932—1933 годов. Трагедия российской деревни, Moscow, Росспэн, 2008, ISBN 978-5-8243-0987-4., Chapter 6. "Голод 1932—1933 годов в контексте мировых голодных бедствий и голодных лет в истории России — СССР", p. 331. ^ Mark B. Tauger. "Natural Disaster and Human Actions in the Soviet Famine of 1931-1933" (PDF). Archived from the original (PDF) on 2012-08-24. Retrieved 2013-01-27. ^ "Internal Workings of the Soviet Union - Revelations from the Russian Archives". Library of Congress. 15 June 1992. Retrieved 19 November 2018. This article incorporates text from this source, which is in the public domain. ^ "The Soviet Famine of 1931-33: Politically Motivated or Ecological Disaster?". www.international.ucla.edu. Retrieved 2015-05-07. ^ Siegelbaum, Lewis H. "Professor, Michigan State University". Seventeen Moments in Soviet History. Michigan State University. Retrieved 26 March 2018. ^ a b Michael Ellman Archived 2012-12-05 at Archive.today, Stalin and the Soviet Famine of 1932-33 Revisited Europe-Asia Studies, Routledge. Vol. 59, No. 4, June 2007, 663-693. PDF file Cite error: Invalid <ref> tag; name "Ellman" defined multiple times with different content (see the help page). ^ a b Lyons, Eugene (1938). Assignment in Utopia. Transaction Publishers. p. 573. ISBN 978-1-4128-1760-8. ^ Walter Duranty (31 March 1933). "RUSSIANS HUNGRY, BUT NOT STARVING; Deaths From Diseases Due to Malnutrition High, Yet the Soviet Is Entrenched". The New York Times: 13. Archived from the original on 2003-03-30. ^ Shipton, Martin (June 20, 2013). "Welsh journalist hailed one of greatest 'eyewitnesses of truth' for exposing '30s Soviet famine". Wales Online. ^ Obenson, Tambay A. (July 23, 2015). "140 New Projects Selected for the IFP's 2015 Project Forum Slate". indiewire.com. Retrieved April 7, 2016. ^ a b Ellman, Michael (2007). "Stalin and the Soviet famine of 1932 – 33 Revisited". Europe-Asia Studies. 59 (4): 663–693. doi:10.1080/09668130701291899. ^ "Ukraine – The famine of 1932–33". Encyclopædia Britannica. Retrieved 2008-06-26. ^ Conquest, Robert (1986), The Harvest of Sorrow: Soviet Collectivization and the Terror-Famine, Oxford University Press, p. 306, ISBN 978-0-19-505180-3 . Davies, RW; Wheatcroft, SG (2004), The Years of Hunger: Soviet Agriculture, 1931–33 ; Harrison, Davies, Wheatcroft 2004 (PDF) (review), UK: Warwick . Ellman, Michael (June 2007), "Stalin and the Soviet Famine of 1932–33 Revisited" (PDF), Europe-Asia Studies, 59 (4): 663–93, doi:10.1080/09668130701291899 . Finn, Peter (April 27, 2008), "Aftermath of a Soviet Famine", The Washington Post . Kuromiya, Hiroaki (June 2008), "The Soviet Famine of 1932–1933 Reconsidered", Europe-Asia Studies, 60 (4): 663–75, doi:10.1080/09668130801999912 . Markoff, A (1933), Famine in USSR . Thorson, Carla (May 5, 2003), The Soviet Famine of 1931–33: Politically Motivated or Ecological Disaster?, UCLA International Institute . Wheatcroft, SG (April 1990), "More light on the scale of repression and excess mortality in the Soviet Union in the 1930s" (PDF), Soviet Studies . Kondrashin, Viktor, ed. (2009), Famine in the Soviet Union 1929–1934 (PDF) (slide stack), Katz, Nikita B transl. docs. ; Dolgova, Alexandra transl. note from compilers; Glizchinskaya, Natalia design, RU: Russian Archives, archived from the original (PDF) on 2009-03-19 .